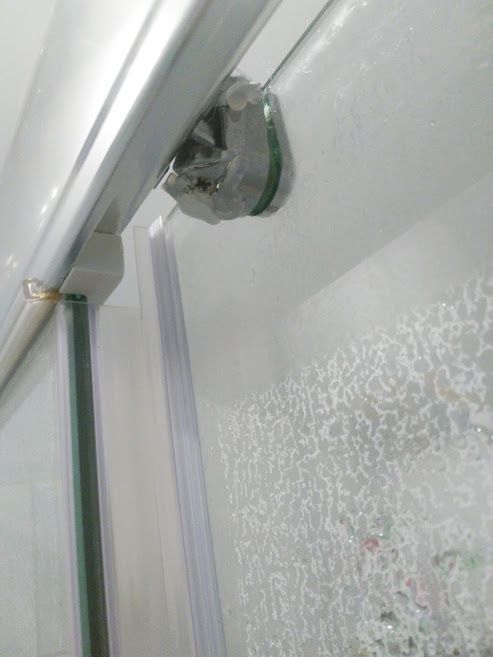 Our shower door has 4 sets of rollers that hold the sliding door. The top two have screws that you adjust to make the door level. 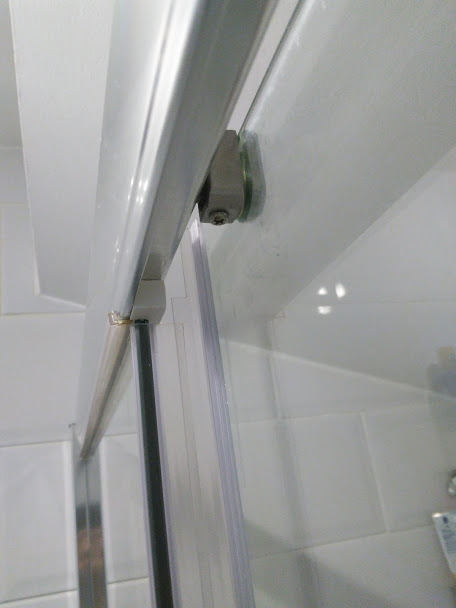 When the door shuts, a magnetic catch seals the side of the door but only if the door aligns correctly to the wall. We bought the door back in 2014 and have had a couple of failures of these bearings before. I’ve previously asked the manufacturer to send out spares. 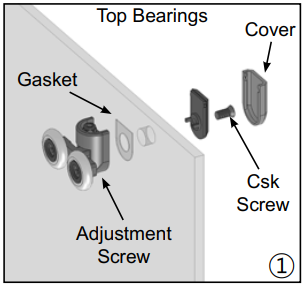 We received a set of 4 bearings and I’ve only got 2 lower bearings left. 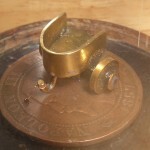 This week, one of the top bearings failed again. That means we’ve had three failures now as I’ve no spares left in the drawer. It failed mid-week and I did not have time to make a replacement one evening. So I just smothered it with hot glue to keep it in one piece till the weekend. 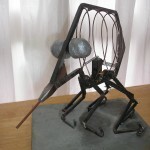 A few years back, I cast a big block of aluminium, which was ideal for this job. The first step was to cut a pocket for the adjuster. 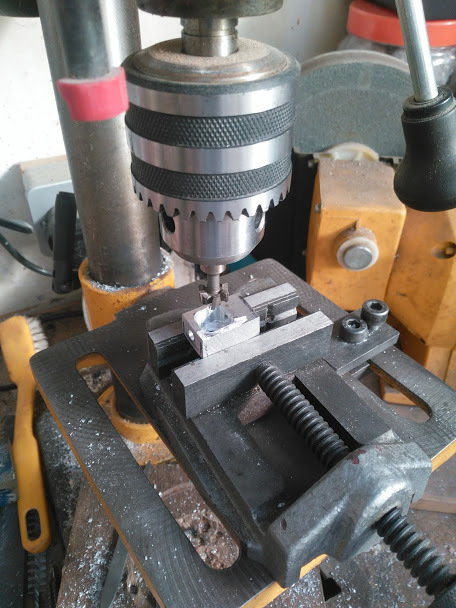 I added a cross vice to the drill and chucked up a milling cutter. This is not really recommended practice as a drill is not really designed for this operation. I should save up for a mill/drill. My first attempt messed up as I cut the hole too big. So I started on a second attempt. This time I cut the block to size first. I used the angle grinder and flap disk to square it up given that my lathe was buried under a couple of other projects. The pocket was milled correctly this time. Then a 5mm hole drilled for the adjustment screw. This was counterbored for the nylock nut that fits on the other end. The last thing was to cut a hole for the mounting screw. 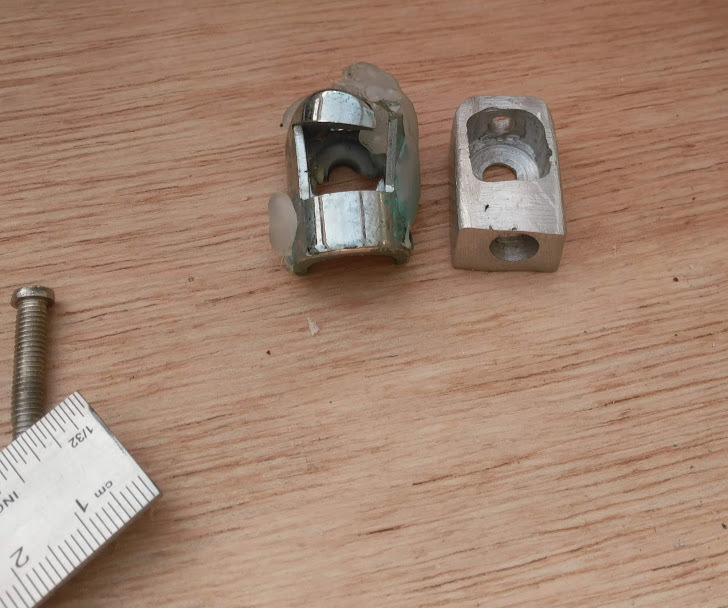 Luckily there was a threaded insert that could be removed from the broken part but this had a large 10mm head. Didn’t have any milling cutters that large but I found a tee cutter which was the right diameter so used that for spot facing the hole. The flapdisk was used for rounding off the corners. A file and some green scotch pads were used for smoothing off the surfaces. 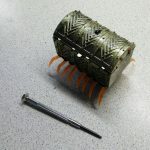 The repaired component should be a lot stronger than the original and hopefully, I won’t need to replace any more. I fitted the part and adjusted the door level again. 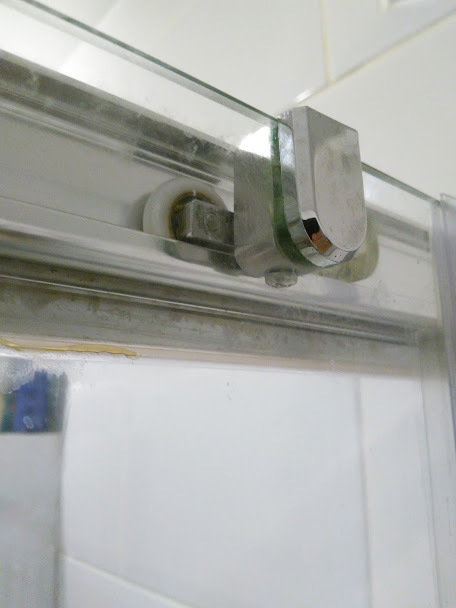 You can see it here with our other replaced part, the 3D printed clip for the stationary pane. Bicycle repair men want you!